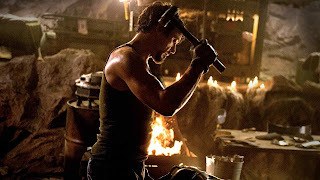 With the upcoming release of the newest entry into the Marvel Cinematic Universe, Ant-Man, I felt it was only the fitting that I re-watched and subsequently reviewed the one that started it all, Iron Man. If you don’t know the story of Iron Man by now then you may have been living under a rock for the past seven years. In any case, the story entails billionaire Tony Stark (Robert Downey Jr.) being captured by an organization known as the Ten Rings. After plotting and executing his escape plan, Stark enters the world of superheroes that forever changes his life and those around him. The absolutely astonishing thing about Iron Man is how small it feels despite being a huge visual effect, blockbuster level film. Chemistry between Downey and Gwyneth Paltrow as Pepper Potts, Tony’s lovely assistant, lets the movie feel real, as if these characters have known each other for a period of time. This holds true for all of the characters. Obidiah Stane (Jeff Bridges) and James Rhodes (Terrence Howard) fall right in alongside Downey to form a spectacular cast that really sells the film. Many years after the film was released, it was revealed that scenes were written the day of shooting. Thankfully this doesn’t hurt the story or characters in anyway and allows the cast to improv when need be to help further the performances. Compliments must also be given to director Jon Favreau. He positions each character to act differently than the other. No character tries to one up the other’s jokes and all play a different role in the main character’s life. Pepper is constantly concerned of what Tony is doing with his life, Stane isn’t just a mustache twirling villain but rather someone who has his own motives, and Rhodes is always the military man, a conventional straight arrow. All these personalities mesh together to form the perfect balance for this action-adventure superhero movie. 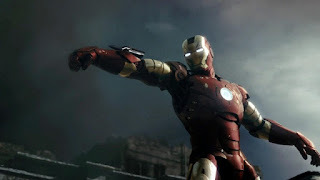 And at its heart that’s what Iron Man is. It’s a superhero origin. Iron Man as a hero is unlike any of the previous superheroes we had gotten pre-2008. The story happened in a real world setting where the villain isn’t a conspiracy or spy organization, but rather the escalating scale of armaments to where we can no longer control them, always wanting something bigger and better. The biggest draw for anyone, besides the characters, acting, directing, or even the humor, is the action. Compared to other similar genre films, there isn’t a ton of action and that’s what makes it so much better when it does happen. The cinematography surrounding each action piece creates a gravity and sense of weight to the situation at hand. In fact the climax might be the best among any MCU film, not only for the fight but what’s at stake. It’s a fight between two men who have had it with the other, who just so happen to be wearing big metal suits.